Masala Ghavan is a simplified version of Uthappam and is an instant version. No soaking, No grinding and No fermentation. This recipe has origins in the Konkan region of Maharashtra. This is as instant as it gets. I have never used garlic in any dosa/uthappam before and was surprised when my friend mentioned garlic as a 'must-add' ingredient. I must agree that the flavor changes altogether. I felt it was a cross between besan ka Cheela and Rava Dosa. Also a glorified version of Neer Dosa. It was a very filling meal. Mix all the ingredients including a teaspoon of the oil and add water gradually to make a watery batter. [I used about 1 1/2 cups of water]. Heat a griddle (my griddle is non stick one, 7 inches in diameter with raised edges), spray oil and pour the watery batter from the edges towards the center. [Typically that is how the batter is poured for Rava Dosa as well]. Cover and let it cook on medium heat for a couple of minutes. Remove the cover, flip the dosa and let it cook on the other side as well. Fold the dosa into quarters and remove from the pan. Serve it immediately with a chutney of your choice. Our favorite happens to be peanut chutney. What an amazing find Harini. I am a big fan of instant idli and dosa (because I’m too forgetful to soak and too lazy to grind) and these dosa look just perfect. I’m definitely going to try these some time soon. Love such kind of instant dosa varieties. They come in so handy when we run out of dosa/ idli batter. Yes.. This is as simple n quick as it sounds! My neighbour here makes it often with garlic n chopped scallions too. She doesn’t cover n cook it although I was love to try ur version soon ! wow thats a super soft and delicious dosa .. 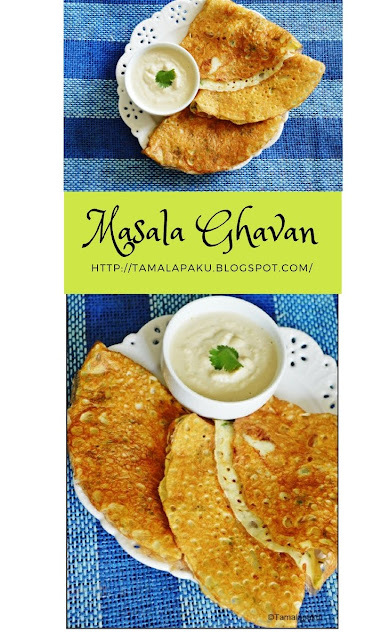 So simple and Instant breakfast recipe, As a garlic lover I would never mind the garlic flavor in the dosa , looks so yummy and your peanut chutney looks scrumptious as well !! Always love instant version ..Many a times i forget to soak rice and dal for grinding dosa battar and this only looks perfect for those days!! Love this kind of instant dosas. It sounds delicious and this is so new to me , bookmarked to try!! Simply love instant versions of dosas, and this instant version sounds prefect for me to prepare for a weekday dinner. Lovely share. I love these terms like Easy..Quick and Instant ! !..seriously they are life savers . Ghavan is new to me , and a interesting recipe.I am sure it would be tasting really good. That is an interesting batter with rice flour and besan. The dosas look so good and I love such instant recipes to the more time consuming ones. Ghavan is something I have been wanting to make for a while now..such a fantastic recipe..good clicks! What an amazing no ferment recipe this is. Totally new to me and I can't wait to give this a try. I love instant dosai/adai recipes for weeknight dinners. Instant dosas are such a blessing!! No ferment batters really saves lot of time!! Ghavan looks perfect, me too never tried garlic in dosas, bookmarking this to try sometime! Must admit, never heard of gavan. However, love your recipe as its easy to prepare and a change from the normal chilas I make. The ghavan look great. I had heard about it but never tried. These kind of instant dosas are life savers for any meal if you ask me.